Liam Fox is sticking to his guns and is still condemning the new Medal of Honor for making the Taliban a playable faction. Earlier this week, Great Britain's Secretary of State for Defence Liam Fox skewered EA's upcoming Medal of Honor, claiming he was disgusted with the game because it allowed players to take on the role of Taliban soldiers as they fought British troops. Even though the man's impression of the game is only partly correct, he's still standing by his opinion. "At the hands of the Taliban, children have lost fathers and wives have lost husbands. It's shocking that someone would think it acceptable to recreate the acts of the Taliban against British soldiers," Fox said on Sunday. "It's hard to believe any citizen of our country would wish to buy such a thoroughly un-British game. I would urge retailers to show their support for our armed forces and ban this tasteless product." Electronic Arts responded to the claims by stating that Fox was portraying the game inaccurately. A spokesman for the publisher said the game, "does not allow players to kill British soldiers." Not only that, but, "no British troops feature in the game." In response to this point, a spokesperson for Fox stated that the man "stood by" his earlier comments. "The point remains that part of this game allows you to play the part of the Taliban attacking [International Security Assistance Force] troops in the area of central Helmand where British troops are operating," they said. 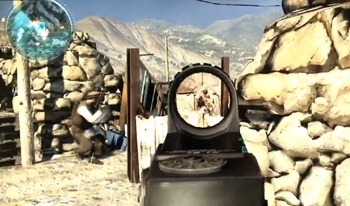 While it's true that players can take on the role of Taliban soldiers in Helmand Valley, this seems to be only for the multiplayer section of the game. The decision to make members of the Taliban playable has sparked controversy and complaints on both sides of the Atlantic, but one of the more surprising supporters of the content came from Hank Keirsey, a retired soldier who works as a consultant for the Call of Duty games. According to Keirsey, "From a soldier perspective, I gotta admire certain qualities in [Taliban soldiers]. They're not fighting for Al-Qaeda. Maybe one or two of them is. Most of them are fighting 'cos they've always fought. They've got what someone told them is a foreigner in town. They're gonna come down from the mountains with their little AKs and rally with other guys and try to beat the foreigner out of there. You gotta get into your enemy's mind set. There's courage on both sides." Meanwhile, the Department of Culture Media and Sport has distanced itself from the Fox's comments: "Dr. Fox was expressing a personal view and we understand why some people might find the subject matter of the game offensive. There is a ratings system in place which exists to categorise games appropriately. In this case, the game in question is rated 18 so should only be sold to, and played by, adults. There is a clear choice for consumers which they can exercise when making decisions about purchasing videogames." While Fox is allowed to voice his personal opinion, his position as the head of Britain's Ministry of Defence might cause people to think that his comments are an official government stance. As a result, I understand why the DCMS is distancing itself from Fox over this issue. What I don't understand is how allowing gamers to play as Taliban soldiers is any different from other FPS games that allow you to play as German or Japanese soldiers in WW2, since many British soldiers lost their lives against both groups during the conflict. It seems like a bit of a double-standard.